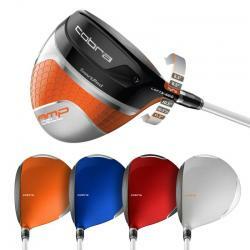 Cobra Golf’s new AMP Cell and AMP Cell Pro drivers not only will be available with player adjustability for six loft/trajectory settings but also to separate themselves from the competition in a choice of four clubhead colors. The AMP (Advanced Material Placement) Cell uses a torque wrench to turn the clubhead from 8.5° to 11.5 plus 9.5° and 10.5° draw settings while the Pro model may be adjusted from 7.5° to 10.5° with 8.5° and 9.5° fades. Both have what Cobra calls “SmartPad technology” which delivers a square clubface at address without requiring adjustment of the sole plate except for the draw and fade settings where the clubface remains slightly closed (draws) or open (draws). Both also have the E9 elliptical face shape with a canted bulge and roll design the company has been using in recent years. The AMP CELL Driver is comes in an offset model (no adjustments) for players fighting a slice with heel-biased weighting. All three models will be in stores next February with the AMP Cell driver MAP at $299, the AMP Cell Pro $399 and the AMP Cell Offset at $249. Cobra also says there will be hybrids and fairways with adjustable lofts and two models of irons coming soon.